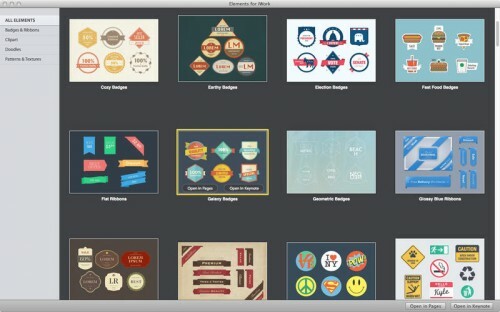 The Elements for iWork collection contains hundreds of doodles icons, badges, ribbons, and clipart pieces. All images include transparent backgrounds that allow placing them on various colors and patterns. The PNG format lets you to adjust brightness, tint and other image parameters. In addition, the high image resolution is suitable for printing. The set was designed for Apple's Pages and Keynote, but you can also use the images in Numbers or iBooks Author. Using Elements for iWork is really trouble-free. All you need to do is download the app, drag the images to your selected location and copy-paste them onto your document.